TV Free Way Antenna Reviews - Is It a Scam or Legit? The digital TV Free Way Antenna allows you to gain access to free over-the-air broadcast programming, without worrying about an expensive cable subscription. After discreetly plugging into the back of your TV, the TV Free Way Antenna promises to deliver all your favorite broadcast network shows, local news, weather, sports, children’s programming, and more—but without a cable contract or hidden fees. According to the company, everything you watch using the portable, digital TV Free Way Antenna will be in crystal clear high-definition, so you’ll be able to “start saving money the moment you plug it in,” while still enjoying your favorite programming. But before you hand over your money, you have some important questions: Exactly what type of programming will you get with TV Free Way Antenna? Can it “get rid of your cable bills”? Are there other, similar options? Let’s kick things off by talking about TV Free Way Antenna’s details. How Does TV Free Way Antenna Work? Although most major networks were transmitting digital signals as early as 2003, the FCC mandated that all broadcasters were to cease analog transmissions altogether as of June 13, 2009. This was known as the Digital Television Transition. Another added consumer-related benefit is that digital signals generally deliver better image quality to your television set, which is what we’ll cover next. We won’t get too technical here, but analog TV signals broadcasted over airwaves immediately begin losing information as soon as the leave the antenna. On the other end, a lot of factors can impact the quality of the analog signal you receive on your set, including structures (buildings and trees) in between you and the antenna, weather, and more. Digital signals, on the other hand, are binary broadcasts (a series of ones and zeros, similar to a computer). This allows signals to be reconfigured on your television exactly as it left the antenna, delivering a much clearer picture. In order to pick up these signals, however, you need to have a digital antenna in place, or at least a converter box, which is where options like TV Free Way Antenna enter the picture. They screw into the cable outlet on the back of your TV, receive digital over-the-air signals from broadcasters like NBC, CBS, FOX, CW, and more, and then display them on your screen. Pro tip: Keep in mind that just because they’re digital, doesn’t mean that all of these signals are in high definition (defined as a minimum resolution of 1280 pixels x 720 pixels). As such, all other factors being equal, you may notice a difference in quality between stations. Sounds great, right? Given the length of time stations have been broadcasting digitally though, does TV Free Way Antenna have any competition? Regardless of how they’re designed or how much you pay, the reality is that all digital antennas ultimately do one thing; they convert over-the-air digital signals into a picture on your screen. So, what should you look for in one, and does TV Free Way deliver the goods? Note: This is a complex topic, and something we can’t even hope to fully cover here. Instead, we’ll talk about key factors you might want to be on the lookout for. Unlike the cable that extends from your wall, over-the-air signals—even digital ones—can only travel so far before they degrade to the point where they’re unusable. This means that if you live in a rural area and are far from an antenna (TV Free Way’s manufacturer recommends no more than 30 miles), you probably won’t be able to effectively use a digital antenna. In an instance like this, you might need to stick with other options. Additionally, even if high-quality digital signals make their way to your home, remember that they still have to make it to your digital antenna in order to be enjoyed on your TV. So, if you place TV Free Way in your basement, or even on an interior wall, you might not get as good reception as if it was placed on an exterior wall. This largely depends on your TV placement, so be sure to keep this factor in mind before placing your order. In the meantime, check out the FCC’s Reception Maps, as well as third-party resources like TV Fool and AntennaWeb, in order to find out how far you are from antennas, as well as which channels are available (keep this thought in mind, because we’ll come back to it shortly). Factor 2: Where Are Your Signals? Are They UHF or VHF? Even if you’re within 30 miles of one or more antennas, you’ll need to figure out which direction signals are coming from. Why? If you’re close with many different channels available (such as in a large metropolitan area), an omnidirectional antenna might be a solid choice, since it can pick up signals from all directions. However, its range is generally less than that of a directional antenna. On the other hand, you’ll be able to pick up signals from farther away with a directional antenna, which might be ideal if you live in a rural area with only one antenna in close proximity. Another big factor to consider is which channels you’re looking to pick up (based on what you found available in the previous section). Lower channels are generally broadcast at UHF frequencies, while higher channels tend to be VHF frequencies. Factor 3: What About Price? We’ve reviewed many different ASOTV digital antennas over the years, including popular options like Clear TV, HD Free TV Antenna, Mohu Leaf, Winegard Flatwave Air, and more. And based on customer feedback for many of these options, we’ve learned that, regardless of what you pay, the reception you get can be finicky. As a result, you might want to focus on lower priced options to figure out if your situation is suitable for a digital antenna. Then, you can spend more money on upgrades at a later point, as long as everything works out. This way, you won’t be out a lot of cash if things don’t work out quite like you expected. From this standpoint, what will you pay for your TV Free Way Antenna? How Much Does TV Free Way Antenna Cost? Standard Offer: $14.99 plus $7.99 S&H. A second digital antenna can be purchased for an additional $7.99 S&H. Comparatively, Clear TV offers many of the same benefits as TV Free Way but is priced at $5 more, while HD Free Way comes in a few dollars less at $15.99. At between $39.99 and $169.99, the Mohu Leaf is significantly higher than TV Free Way, although their top-priced model promises to pick up signals from as far away as 60 miles, and can even be mounted outdoors to maximize reception. Similarly, Winegard’s Flatwave Air is priced at $130, which is built to be mounted outdoors as well. These antennas also feature proprietary technology that promises to minimize pixelation, dropouts, and signal distortion, while remaining 50% smaller than much of the competition. Regardless of which option you choose, your TV Free Way order will come with a 30-day return window, less S&H. Note: This means that if you add a second antenna to your Plus offer and request a refund, you’ll immediately lose about $26 in S&H charges. To request a refund, BulbHead (a division of Telebrands) customer service can be reached at (844) 814-9723. Will TV Free Way Antenna Help You Cut Your Cable Bill? If you’re looking to get rid of your high cable bill—which is arguably the main benefit promoted by TV Free Way’s manufacturer—there are a few important factors to consider. Note: We cover all of these factors (and more) in much greater detail in 3 Easy Steps for Cutting the Cord & Saving Money. So, if you’re looking for additional information, be sure to give it a read. Which Channels Will You Receive With the TV Free Way Antenna? While TV Free Way might be able to help you continue watching TV after canceling your cable contract, it will not give you access to cable-only programming. Instead, it will only deliver over-the-air programming from major networks like CBS, NBC, FOX, ABC, CW, and so forth. So, if all of your favorite programming is aired on these over-the-air networks, then you should be able to continue watching uninterrupted after canceling your contract (subject to antenna range, of course). On the other hand, if your favorite shows are only available on premium networks like HBO, Showtime, FX, Lifetime, and so forth, you’ll largely be out of luck. Will You Need Any Additional Hardware or Subscriptions? When it comes down to it, TV Free Way is simply a piece of equipment (a tool) that provides access to digital over-the-air signals broadcasted by major networks. Similarly, if you’re looking to regain access to most of your favorite cable-only programming after canceling your subscription, you’ll need to purchase the necessary equipment. This includes popular “stick” devices like ChromeCast, set-top boxes like Roku, as well as streaming services like Hulu Plus and Netflix. What’s the point? In the end, in addition to purchasing a digital antenna like TV Free Way, you’ll likely need to choose the hardware and subscriptions that best meet your needs. Again, we’d recommend reading 3 Easy Steps for Cutting the Cord & Saving Money to help put you on the right path. Pro tip: Just remember that, between purchasing additional equipment and signing up for streaming subscriptions, it’s super easy to spend just as much (or even more) than you were with your cable subscription. So be sure to keep a close eye on your budget during this part of the process! What’s Everyone Saying In Their TV Free Way Reviews? Finally, while there weren’t any online customer reviews for the TV Free Way Antenna at the time of our research (it was a brand new product), many of the other ASOTV digital antennas we’ve reviewed tend to come with lower-than-average customer feedback. What’s everyone saying? Most customers seem to complain that these antennas don’t deliver very good reception, even within an acceptable range of an antenna. Many have even stated that they couldn’t receive a single channel. Other common complaints include high, non-refundable S&H charges and less-than-stellar customer service. Admittedly, all of these options come from different manufacturers than TV Free Way, so we’re not saying you’ll experience any of the same. However, given the similarity of these complaints between manufacturers, we’d certainly recommend keeping it in mind. Will the TV Free Way Antenna Meet Your Expectations? We’ve definitely covered a lot of territory in this review, but based on our experience researching hundreds of different ASOTV products, we think your ultimate satisfaction largely comes down to your expectations. What do we mean? For instance, if you’re looking to cancel your cable bill but maintain access to bare bones over-the-air networks like NBC, ABC, CBS, and a handful of others, as long as you’re within range of an antenna, TV Free Way might deliver. However, if you’re expecting it (or any other digital antenna) to help you maintain access to all your favorite premium, cable-only programming, but without an expensive contract, then you’re bound to be disappointed. In our opinion (after all, we’re consumers too! ), perhaps the biggest drawback to TV Free Way is the high, non-refundable S&H charges. After all, you can find functionally identical digital antennas at just about any big box retailer, without paying a nickel for shipping. And if you’re dissatisfied, processing a refund can then be as easy as hopping in your car. For these reasons, if we were in the market to spend our hard-earned money on a digital antenna, we might consider searching locally before placing an online order for TV Free Way Antenna. 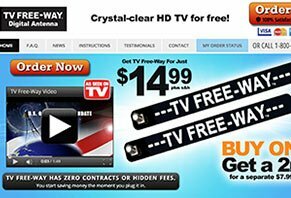 Before purchasing my TV Free Way Antenna, I researched what local channels I could receive using the link on TV Free Way's website. According to that list, I would receive six (maybe eight) channels. Considering the one-time price, I was content with that. When I installed the device and did a channel scan, I am getting 26 channels. I never knew there were sub-channels. I was so happy that I bought another one for my other TV and one for a friend too! Do your homework. If you are happy with the local channels you could receive, buy it. Remember, this is NOT cable or satellite, and if you can't pick up the channels with a regular antenna, you won't with TV Free Way Antenna. I purchased my TV Free Way because we don't really watch TV often. We can pick up about 15 channels including local channels. Sometimes, the station will stick, but most of the time the reception is great. Well worth the money. If you are expecting this to be like cable TV or satellite, you will be disappointed. But if you just want local channels plus a few extra channels you will be happy with this purchase. We purchased a new digital TV shortly after Christmas and after hooking it up and channel turning, we get 15+ channels. We got 13 before moving TV Free Way to the nearest window. I love it. By moving it around, we can get every channel in except for CBS. By far better than any of the other more expensive indoor antennas that we tried and returned. We won't ever go back to paying for free TV again! The TV Free Way is the best! All ten flat antennas we bought are junk compared to the TV Free Antennas. We live in the mountains and this really work's. You do have to find that sweet spot but were surprised and satisfied with the channels. We've gotten 20 or after we bought this product. We got them at the Walmart in Madisonville, TN. It's been three months and they've been out. There's a lot of people looking for these around here. Thank you. Go to Target and buy one. Cheap, and I get at least 20 channels. NBC, CBS, Fox (local). I connect my laptop to the TV to watch movies. Perfect. I am not paying Comcast anymore. And there are two kid channels that keep my granddaughter very happy. Absolutely the easiest way to obtain 50+ channels, including the major networks (ABC, CBS, NBS, PBS, FOX). We have great reception. I love the affordable price, and we picked ours up from Target. So, so simple and easy to install. Completed in approximately five minutes, including opening the package. I would highly recommend! We bought the TV Free Way hoping we would be able to use it in our RV. Sadly we cannot even get the local channels from our house. I'm pretty sure that when we do try it in the RV, it's not going to work at all. We won't be telling our friends to buy one. I purchased this small, cheap antenna to hopefully be able to pick up a few local channels in my area. We recently canceled our Dish Network Satellite service due to the very high price increases, and to the fact that half the time it wouldn't even pick up the satellites due to a raindrop, snow, or high wind. It seems that it stayed OFF more than ON, and had continually gotten worse over the past years or so years. Anyway, although we had turned to watching Internet Television, like NetFlix, I like to watch the local channels occasionally, so I came across this antenna. I followed the instructions, hooked it up, searched for channels, but it would not pick up ANYTHING, unless you like to listen to static on a fuzzy screen, LOL. I unhooked it, hooked it to another TV, tried again, and nothing. Maybe mine is defective? I mean, it looks like it's only three pieces of moving plastic hooked together by a small silver screw, get real, what is suppose to pick up the channels? The silver screw? Please don't waste your money. The TV Free Way digital antenna didn't work at all. I bought one because the antenna I had would not pick up any channels. Seeing the advertisement, I thought this was a miracle. NOT! The picture becomes all pixelated if you even move your arm. I went back to a set of rabbit ears, and it picks up hecka channels. Keep your cable, there are ways to trim your bill, but this is a waste of time because you'll go back anyhow. Write a Review for TV Free Way Antenna!